Preheat oven to 350 degrees F (180 C). Butter a 9-inch round cake pan and line the base with parchment or waxed (greaseproof) paper. Toss the strawberries in a little of the flour, to coat. Cream the butter and sugar until light and fluffy. Beat in the eggs, one at a time, beating well after each addition. Fold in the orange zest (rind), flour, baking powder, and strawberries in 3 batches. Stir to combine after each addition. Pour the mixture into the prepared pan. Bake for 50 minutes, or until a skewer inserted in the middle of the cake comes out clean. Cool in the pan for 10 minutes before turning out onto a wire rack to cool completely. Place the strawberries and sugar in the bowl of a food processor and process to a puree. Fold into the whipped cream. Ice the cake and decorate with the strawberries and serve. 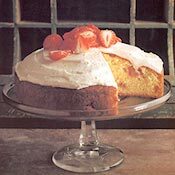 i like your strawberry cake recipe but how do i get heavy cream?i have been searching throughout the shopping complex but can't find it. Amy, you can find heavy cream at your supermarket in the dairy section. Depending on where you live, it may be called double cream or heavy whipping cream, or just whipping cream. In the United States, it is called heavy cream or whipping cream. In Europe and in some other countries, it is called Double Cream. Good Luck! My MIL made this cake as a wedding gift for a friend's wedding and it was so good she also made it for my sister's wedding. It was great, wonderful and awesome!! I am going to make this cake tomorrow and I am so excited! Thanks for such a great recipe!